The new year brings much-needed breathing time to address email marketing strategies. In this post, I’ll explore email marketing trends and offer four suggestions for email strategy for 2017. During the holiday rush, your site likely acquired new subscribers and first-time buyers. These new email recipients are extremely valuable to your business. It’s imperative to nurture them. Consider the following ideas. Use appropriate frequency. New subscribers from the holidays are likely gift purchasers. They may require a lower volume of emails. Send relevant offers. Analyze what new customers purchased, and the amounts, to send relevant offers. 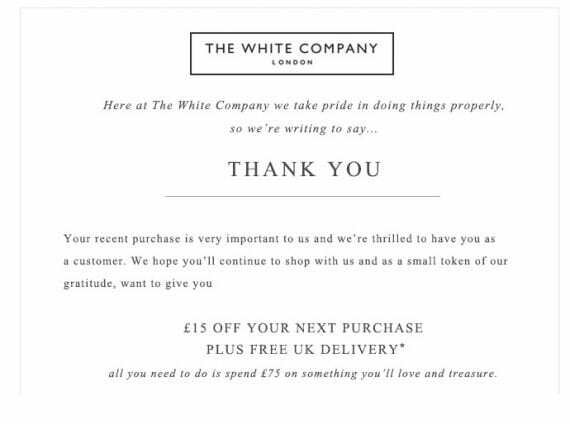 The White Company, a clothing and home furnishing retailer, sends a special thank you email to new customers, with a coupon for a subsequent purchase. For 2017 your email strategy should emphasize mobile, making it as easy as possible for recipients to complete a purchase from an email opened on a smartphone. Roughly one-third of all online purchases are now done on a phone or tablet. If you are not designing emails for smartphones — to be read and to enable a purchase — you are leaving money on the table. But getting clicks from an email on a smartphone can be difficult. Here are tips to increase opens and clicks from mobile users. Use responsive design so email renders correctly across all web browsers and email clients. In a study from MailChimp and Litmus, responsive design increased clicks from mobile users by nearly 15 percent. Preview email creatives (especially when not using responsive design) on tools such as Litmus, and design creatives to be optimized for the browsers or clients that make up most of your subscriber file. For most brands, this will likely be iPhone users on Gmail. Write a draft calendar for 2017 that includes the types of emails or promotions you want to run throughout the year. These can be repeats of successful campaigns from 2016, new ideas, or even replicating what competitors have done. The point of the exercise is to physically write a plan on a calendar, as a high-level schedule. This plan will provide a basic roadmap that can be refined monthly. As each month approaches, you can finalize offers, themes, frequencies, and other details. Attend an email-specific conference or webinar.